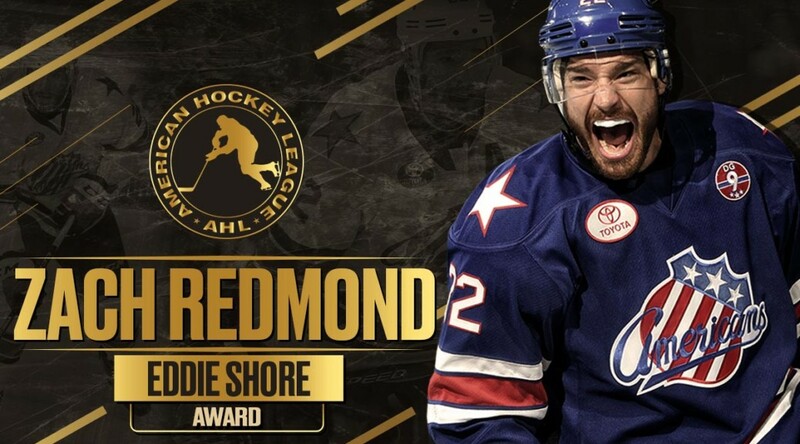 Redmond Earns Eddie Shore Award as Top Defenseman · Let's Go Amerks! This award was first presented by the AHL in 1958-59 in honor of the late Eddie Shore, a member of both the Hockey Hall of Fame and the American Hockey League Hall of Fame who is widely regarded as one of hockey’s greatest defensemen. Shore won a total of seven Calder Cups in his career, including two as the general manager of the Buffalo Bisons and five as the longtime owner of the Springfield Indians. Previous recipients of the Eddie Shore Award include Steve Kraftcheck (1959), Bob McCord (1961, ’67), Al Arbour (1965), Jim Morrison (1966), Noel Price (1970, ’72, ’76), Brian Engblom (1977), Terry Murray (1978, ’79), Dave Farrish (1982), Brad Shaw (1987), Dave Fenyves (1988, ’89), Eric Weinrich (1990), Darren Rumble (1997), John Slaney (2001, ’02), Niklas Kronwall (2005), Johnny Boychuk (2009), Mark Barberio (2012), Justin Schultz(2013), T.J. Brennan (2014, ’16), Chris Wideman (2015), Matt Taormina (2017) and Sami Niku (2018).